You guys have given a lot to us, now it’s our turn to reward you back for your hard work. Geek of the month program exclusively appreciates the contributors who have been continuously putting their effort to make us better and better and much better. Be it articles, algorithms, codes, Q&A, blogs, info graphics, comments or suggestions ,these guys have proved their mettle in some place or the other every now and then. Selected candidates will be given a rewarding certificate. 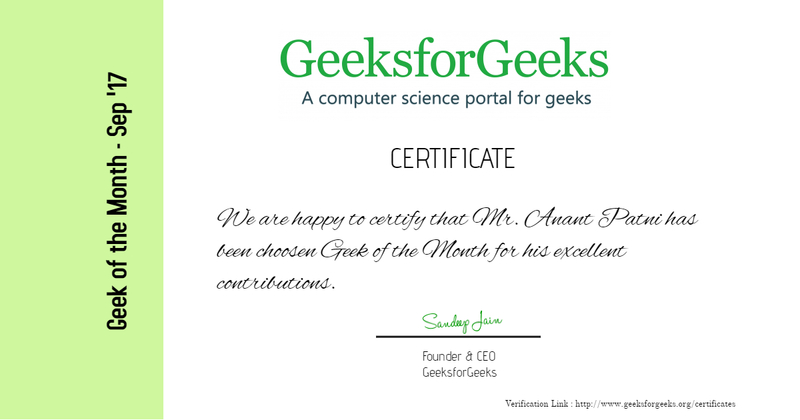 Geek of the month can tag or credit this honor at his/her resume, email signatures, LinkedIn profile, blogs, Facebook pages, personal pages etc. Paid internship opportunity at GeeksforGeeks. 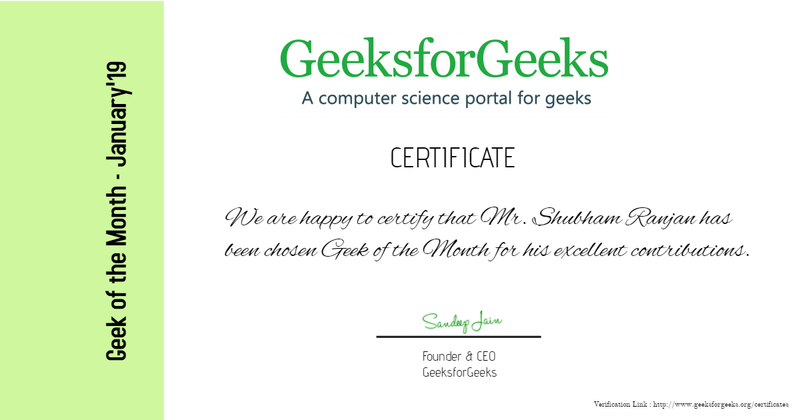 How can I become “Geek of the month”? 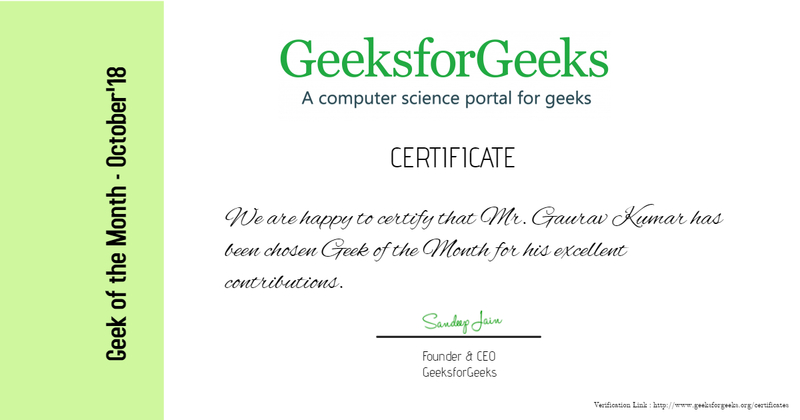 Geek of the month is decided by the end of every month on the basis of number of published articles by a contributor and quality of content, the latter being the principal metric. You can also win this reputed title and add stars to your resume. Start today and share your knowledge by writing articles. Testimonial: First of all, I would like to thank GeeksforGeeks community for awarding me with such an awesome title. During this whole period of my content writing internship, writing articles for GeeksforGeeks helped me immensely in upgrading my coding skills. This prestigious title has now encouraged me towards writing more and even better articles. I would once again thank GeeksforGeeks. 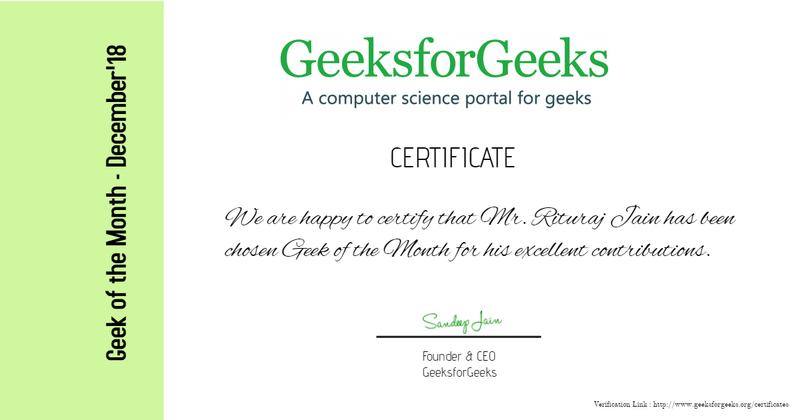 Testimonial: Thanks a lot GeeksforGeeks for awarding me with this amazing title. I have always been passionate about teaching and helping others and thus, the role of ‘Technical content writer’ suited me well. It also helped me improve my own writing and programming skills. I will keep contributing more articles in the future hoping it will help others in increasing their knowledge. Once again, thanks for this amazing title. Testimonial: Thank you so much GeeksforGeeks for providing me with this wonderful opportunity to write for India’s one of the largest portals for Geeks. 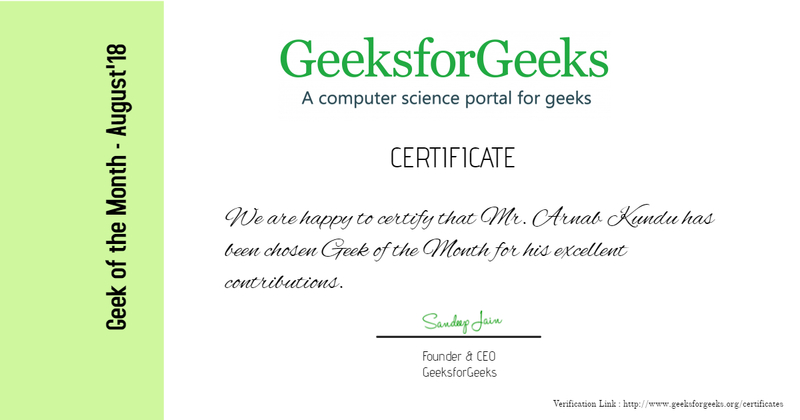 I would like to extend my sincerest gratitude towards the GeeksforGeeks team for giving me such an opportunity and platform that not only has helped me enhance my skills and knowledge as a content writer but also helped me learn and grow immensely throughout this journey. It is always a great pleasure, when someone contacts you on your social media handle and thank you for the articles that you have written which helped them clear their doubts or helped them digest some of the difficult topics. This program has benefited me immensely at the personal and intellectual level. Finally, I would like to recommend all the aspiring young folks out there to be a part of this wonderful journey and experience it all for themselves”. 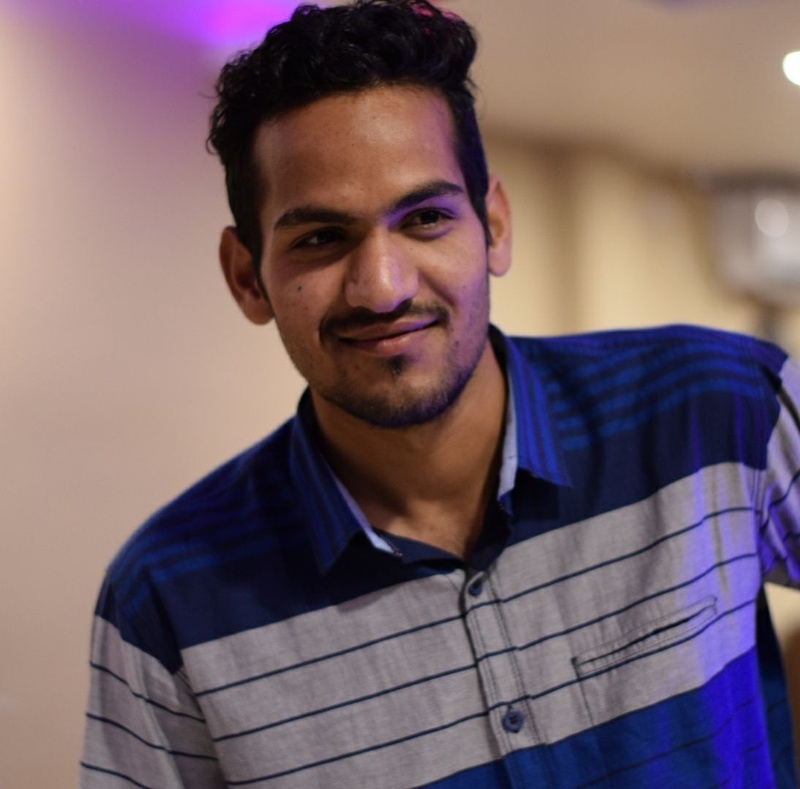 Testimonial: “First of all, thank you GeeksforGeeks for providing me an opportunity to contribute to this amazing platform and also appreciating my efforts. 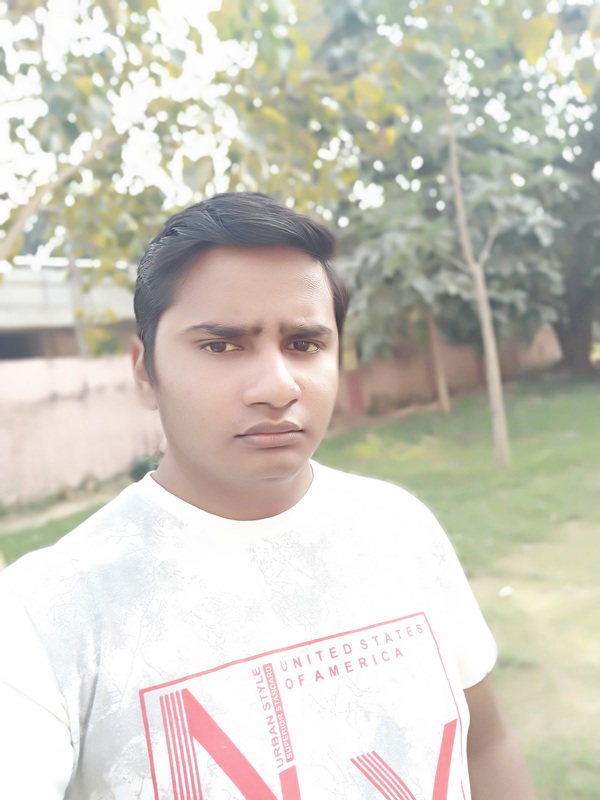 GeeksforGeeks has always been a major source of knowledge for me and to be able to share my knowledge with others through their website gives me immense pleasure. Publishing article on any topic requires a great understanding of that topic which has helped me to strengthen my concepts. Contributing codes for the existing articles has enhanced my ability to read and understand the code written by others. I suggest that everyone should try contributing to GeeksforGeeks. Not only will it help the other geeks but it will also help you to learn and master new topics. Testimonial: “Thanks a lot GeeksforGeeks! I still remember the day when I applied for content writing internship at GeeksforGeeks. Since then, I have always been committed towards contributing my best for the organization. 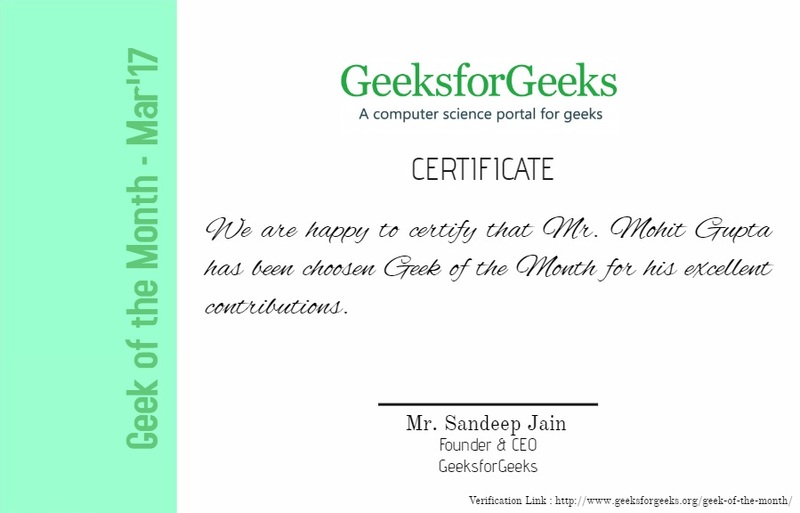 An accolade of “Geek of the month” is really a huge encouragement and awards like these not only endorse our commitment towards the organization but also ignites within us the fire to keep stretching ourselves more and more. 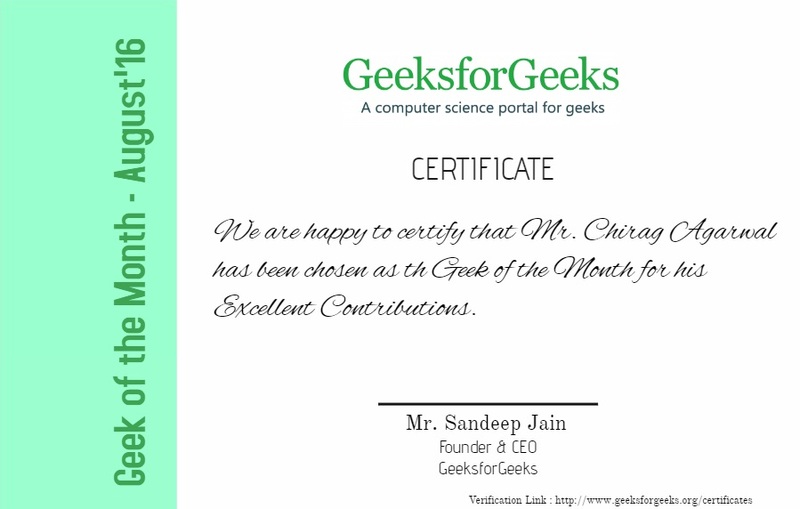 Thank you so much to complete team of GeeksforGeeks!”. Testimonial: “At the very outset I will extend my huge compliments to GeeksforGeeks for the acknowledgement that I have received from you.It has been a great voyage so far. GeeksforGeeks has got me introduced to the very new world of computer science and programming scenario.It has imbibed so many intstrumental skills in me that I can boast about having a wide range of knowledge in variety of fields pertaining to computer science field.Gfg is the edific of the ground where the real elixir emerges and it was gfg only that drove me to dive deep into anything and churn out the best out of it. Gfg is one of the construcive and the most prominent platforms to learn and practise with different types of topics,articles and resources available over here.And I will indeed suggest all the computer science aspirants to go through it thoroughly and develop a deep interest into it.”. Testimonial: “I would like to thank the entire GFG team for providing me the opportunity to contribute articles. Being a content writer, I learned something new from every article I have contributed and I gained most of the knowledge from the GeeksforGeeks. 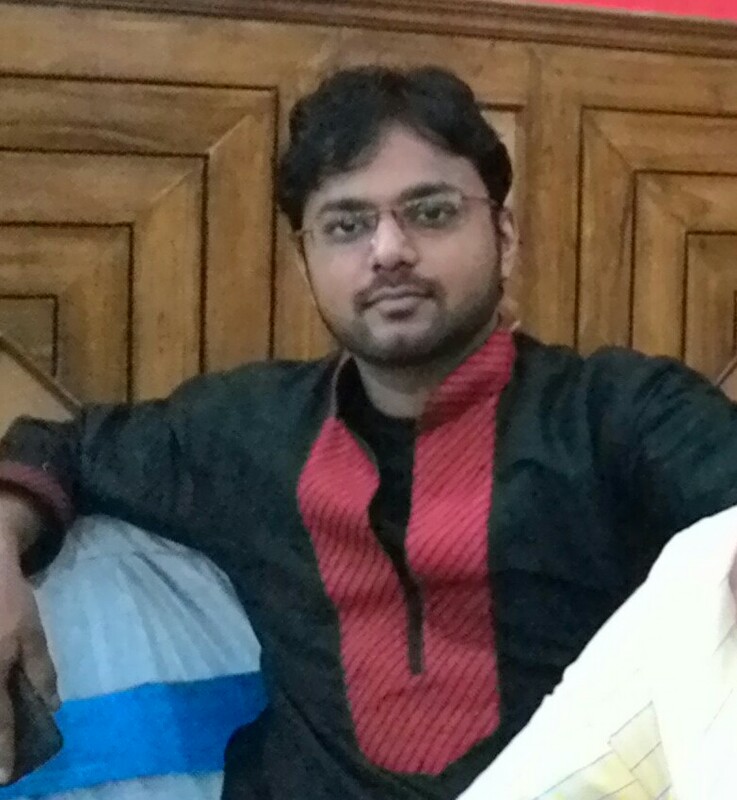 Writing articles helped me a lot to improve my competitive performance. I would like to suggest everyone to go through the articles provided on GFG. So, Keep coding and keep writing. 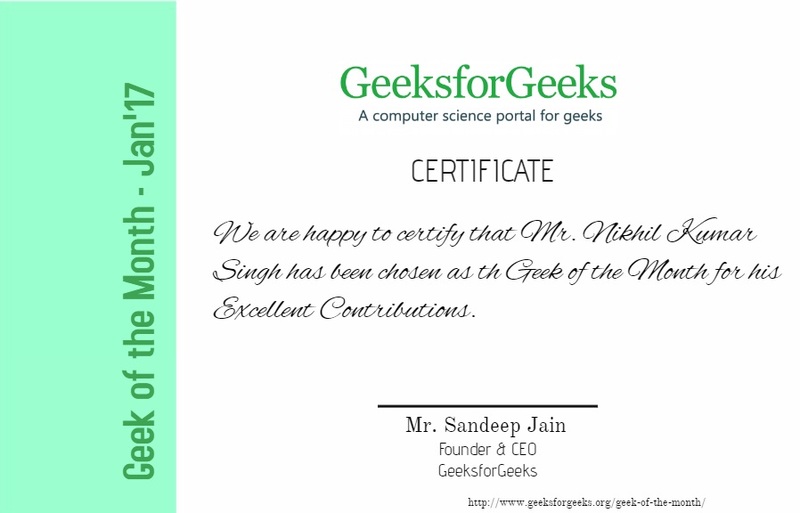 Testimonial: “I would like to thank GeeksforGeeks for the honor and I am glad that I am a part of it. I started my content writing internship at GeeksforGeeks in my first year. 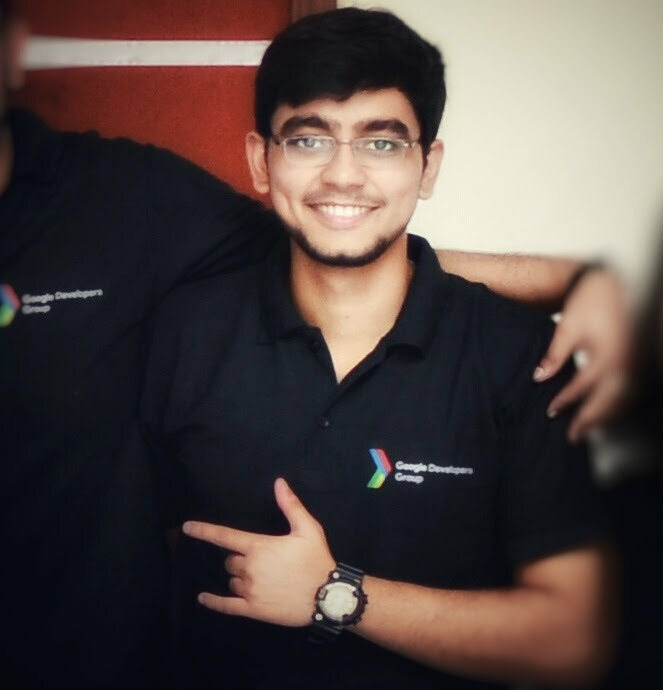 The internship has helped me a lot in clearing my concepts in various fields. GeeksforGeeks has been helping many engineering students to have a better understanding of several algorithms ,data structures and programming languages. GeeksforGeeks has detailed articles on various topics of Computer Science and it has helped me a lot in improving my Competitive Programming skills. I sincerely thank GeeksforGeeks team for all the help and support they have provided me during my internship period and for providing such a wonderful platform to gain knowledge and help others”. 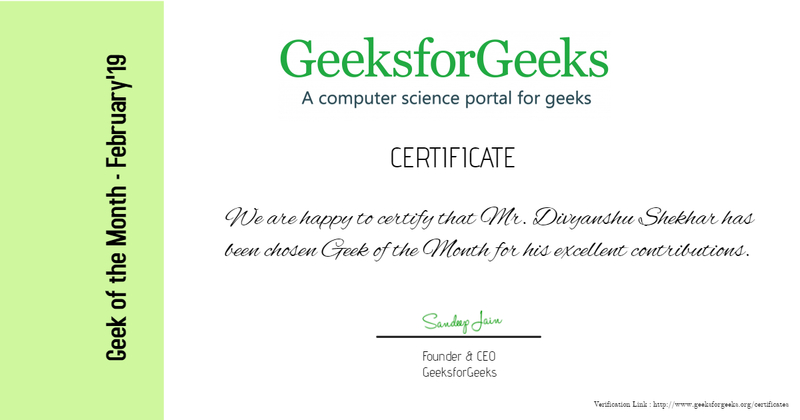 Testimonial: “I would like to thank GeeksForGeeks for choosing me as the Geek of the Month. I loved working with the Geeks team throughout the entire month. I learned a lot of new and creative things about content writing, like proper formatting, clarity of expression, Latex formatting. Apart from that, obviously it is a very good feeling to share your knowledge and problem-solving skills with the community. 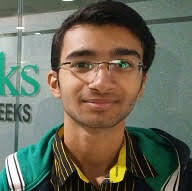 I believe that GeeksForGeeks is doing a really great job through its website, by helping thousands of students to learn and understand and develop technical skills, apart from offering great support during Internship and Placement preparation for college students. It is a wonderful feeling to be a part of this great team. 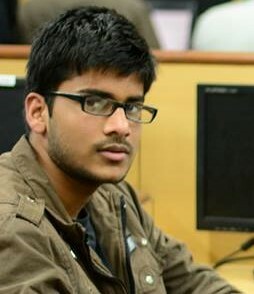 I would recommend all the students who are interested to go through GeeksForGeeks for any sort of doubts/ explanations for any kind of Computer Science fields. Testimonial : I would like to thank GeeksforGeeks team for choosing me for this title. 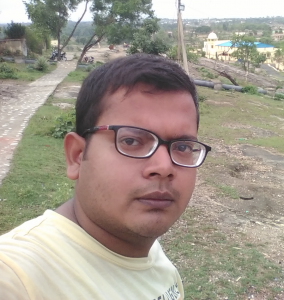 I have a good learning experience working as technical content writer with GeeksforGeeks. It is through continuous support and feedback provided by GeeksforGeeks team that I am able to accomplish my tasks and share my knowledge with other geeks. Technical content writing has certainly improved my problem solving and explanation skills. 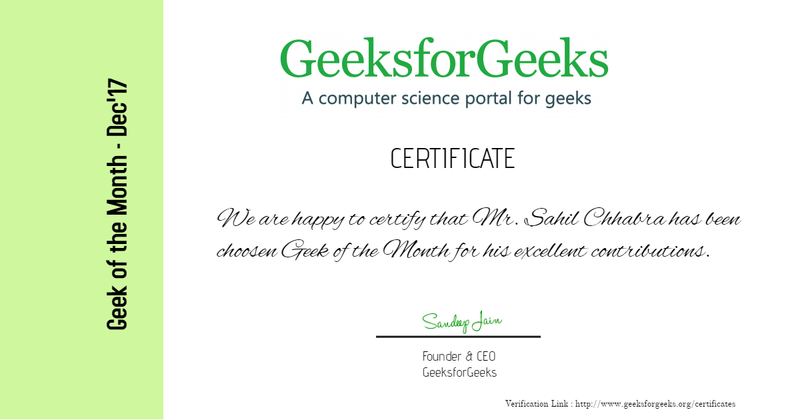 At last, I will like to thanks GeeksforGeeks team for providing such an amazing platform where one can learn a lot of new concepts and at the same time share their knowledge with other geeks. In my opinion, one should surely try their hands at technical content writing because as the saying “Knowledge increases by sharing but not by saving”. Testimonial : I’d really like to thank the Geeksforgeeks team for this honor. It has been an amazing experience, writing articles for a platform this huge. Writing articles on any topic requires reading about it in great depth, which has only increased my knowledge to a huge extent. 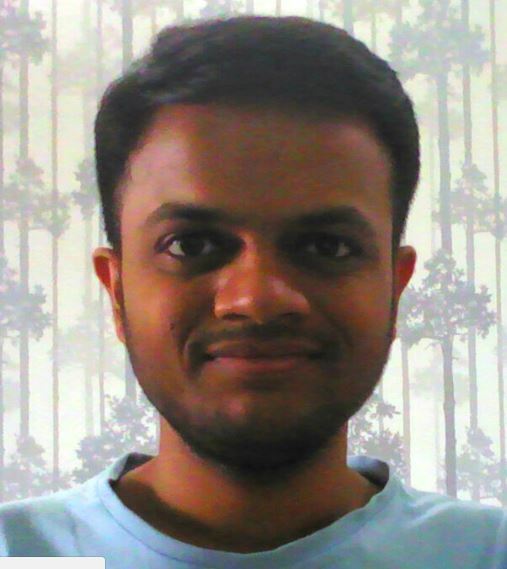 Be it algorithms and data structures or operating systems and microprocessors, each article has helped me strengthen my concepts. It gives me great pleasure knowing that there are thousands out there who will be reading my articles and benefitting from them. “What’s the use of knowledge if you can’t share it with others?”. Geeksforgeeks gave me the perfect opportunity to achieve that. I’d recommend all of the readers to give technical content writing a try, you’ll not regret it at all! Testimonial : Thank you so much team GeeksforGeeks for choosing me for this title. It really takes a lot of hard work and patience to accomplish all tasks related to G4G, whether it’s conducting workshops, or writing great articles, or any minor thing. All because, you are a part of such a great tech team, so you have to keep the things perfect from all edges. Team of G4G is so much supportive and passionate to help us in all aspects. It has helped me to inject programming in my veins. Various programs by G4G helps students in learning with earning, as it offers a lot of opportunities including an outstanding Campus Ambassador Program, Paid Internship Opportunities, Incentive based program, Placement Opportunities etc. 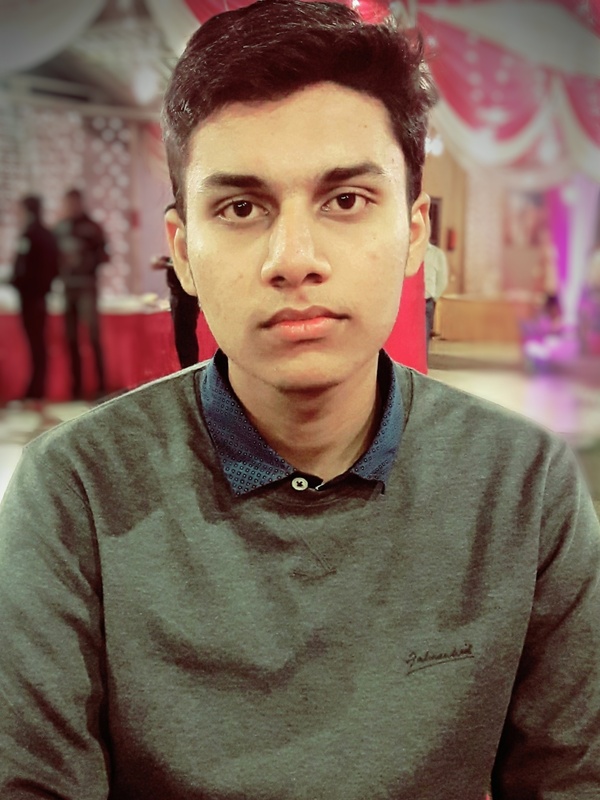 A big thumbs-up to the G4G team for providing such a great platform to students all over the world, where we get the opportunity to develop our skills, let it be public speaking during workshops, technical writing, problem solving or anything related to my Computer science branch. 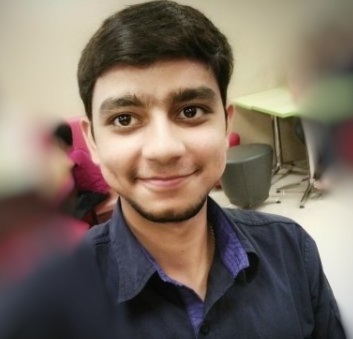 Testimonial : It has been a good learning experience for me working as an intern at Geeksforgeeks and I would like to extend my gratitude towards the team for giving me such an opportunity and platform that not only has enhanced my skills and knowledge as a content writer but also helped me learn and grow immensely. As a student, the kind of articles that came my way, helped me grasp some crucial topics and that knowledge helped me stand out in many situations such as examinations, interviews, and competitions. Also, I have imbibed the subtle art of time management and being organized due to the kind of work platform the team has provided me with. 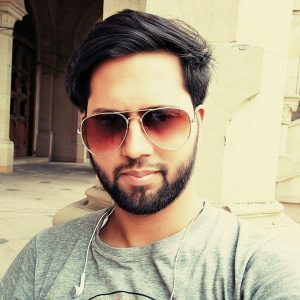 Today Geeksforgeeks is one of the biggest platforms for anyone who wants to learn anything related to Computer Science and it is not restricted to a few topics but a large spectrum which enables greater assistance to people. 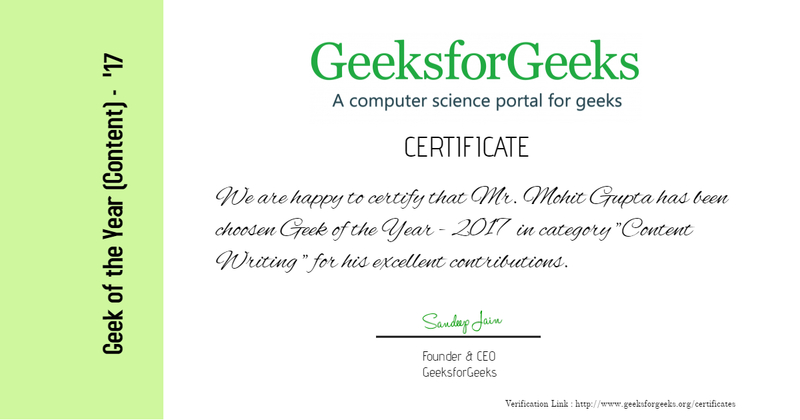 At last, I would like to thank the Geeksforgeeks team for having me as a part of this amazing team and I hope that my contribution to this portal would be fruitful to any such categories available on the platform. Testimonial : First of all, I would like to thank the entire GFG team for the opportunity and for their continuous support. No doubt that GFG is the best coding platform today. Optimization of code is the real game in computer science and GFG is the best weapon to be the winner of this game. GFG has taken off in the search engines like a rocket, with their hard work and continuous efforts. Apart from programming, a lot of questions are asked from the subjects like C/C++/OS/CN/DBMS when you sit for an interview. GFG has large number of quality articles on all these topics all setup in a well structured manner. Overall, so far, it has been an excellent journey working as an intern here. I am glad to be a part of such an amazing and supporting team. 1)The quality of the articles you write, matters a lot, because you are contributing on a platform where a lot of people are going through your content. 3)Provide the content in easy language, so that everyone from beginner to expert can understand it easily. At last, it doesn’t matter how big or small your contribution is, just keep going because while teaching others we teach ourselves. Testimonial : I will love to thank the team of GeeksforGeeks sincerely and wholeheartedly for the support that I have been provided with. Its been a great journey with you, where I have been able to get the best out of myself. Writing contents has immensely increased my problem-solving and explaining skills. I am looking to gain more in the upcoming days from the “Google of Codes”, as I call GeeksforGeeks. Testimonial : Gratitude is the expression of heart. 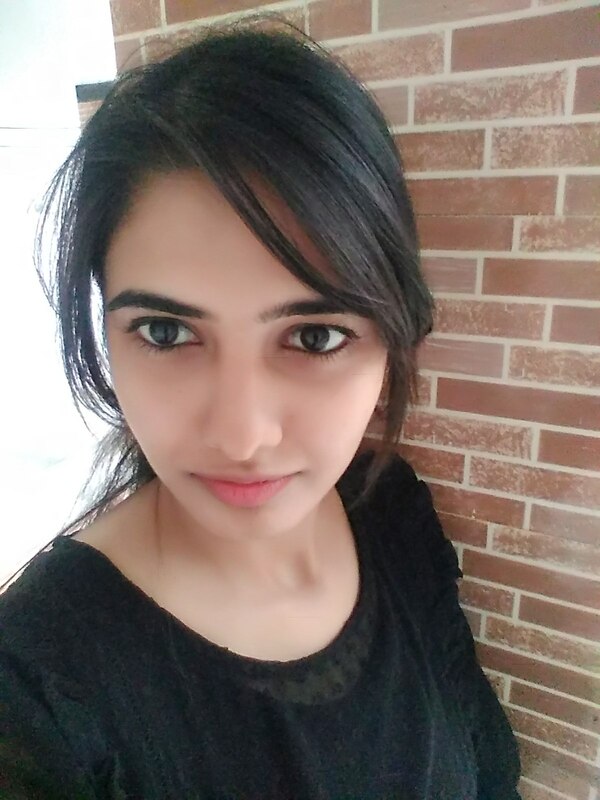 Being a content writer at GFG , I would like to express my sincere gratitude towards it as it helped me a lot to think out of the box and compile articles that enhanced my technical skills in the area of Competitive Programming. One learns a lot when one tries to set up new and unfamiliar problems.Being a student, GFG provided a path to step forward in a planned and systematic way to learn and acquire knowledge which builds up a strong base foundation for the beginners. 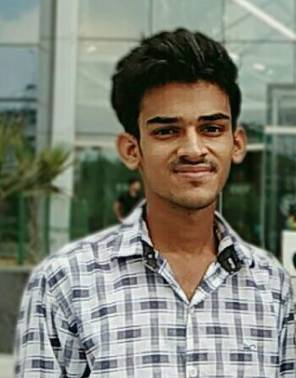 The availability of rich content in different subjects of computer science helps a student to resolve his queries to a great extent. innovate and contribute so as to help others. Testimonial : Being a Content-Writer and Problem Setter on GFG what I have learnt is that having good programming skills doesn’t make you a good programmer/coder. To be good in this you must have the vision to judge other’s code also i.e. solving issues or removing errors by understanding other’s code is the key point to check yourself. While going through over other user’s code, you will get to know the more tricks and techniques to solve a problem which will help in enhancing your knowledge and you will also get to learn some good writing skills. “Learn while you write or Write while you learn” is the best thing which GFG is providing to us and also what I like the most. So, Keep Learning and Keep Writing. 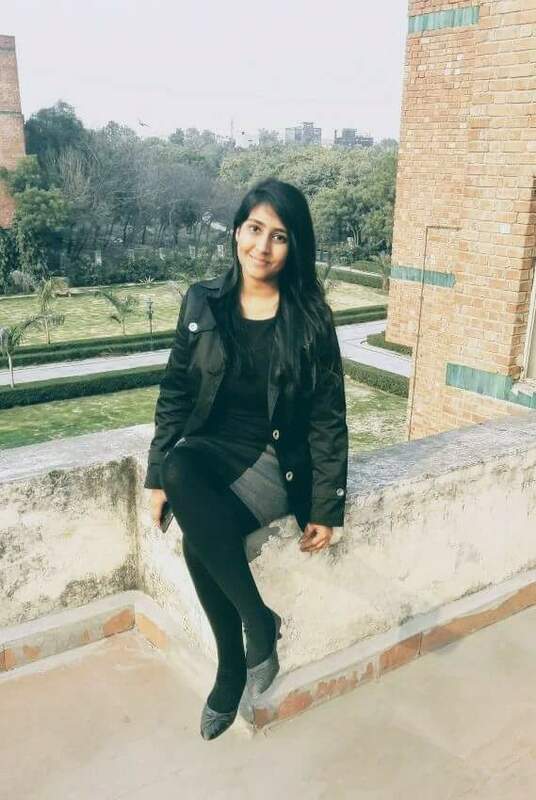 Testimonial : As a GFG content writer and final-year student, I had visualized that GFG helps students for both the perspective that reinforces concepts and knowledge, or to prepare for their future placement opportunities. 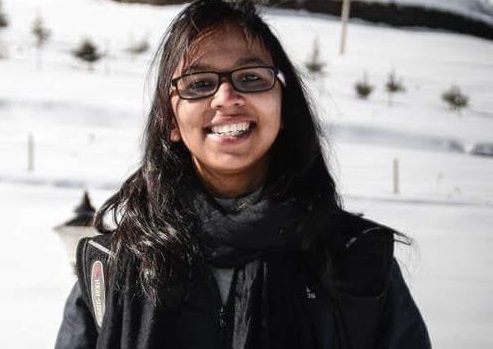 Starting as a beginner, I had explored myself about a wide range of concepts related to DS and algorithm from GFG, which provided me with many different effective problem-solving techniques. In addition to the subjective knowledge and placement preparation, regular training at GFG will certainly improve your approach to competitive programming. The best of GFG that has made a huge impact on me are daily updated articles on the homepage that offer a random but effective level of knowledge for students. Testimonial : Being a content writer, I covered Competitive programming problems, applications and efficient implementation of pre-existing Data Structures and Algorithms. I learned something from every article I contributed. I would recommend content-writing to others as well as it will only broaden their concepts. Also, while writing an article, make sure to target beginners as well. A big thank you to G4G for helping many others like me. Testimonial: GeeksforGeeks is the all-in-one destination to Computer Science related queries. It’s amazing to find all resources of this field at one place and arranged in a systematic way.The articles have elements of both quality and quantity which makes a perfect combination. Proper formatting of code and clean coded solutions to almost all problems can be found here. One thing which makes me visit the website regularly is that the content is frequently updated and hence one can always have an idea of what kind of questions are being asked. Also, detailed reference material of core computer science subjects like DBMS, COA etc. are provided on the website which is very useful for exam preparation. 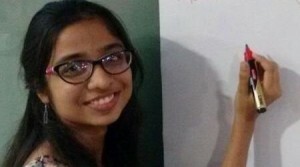 With wide-ranging, GeeksForGeeks serves as the perfect platform for learning any beginner or advanced computer science related topics. 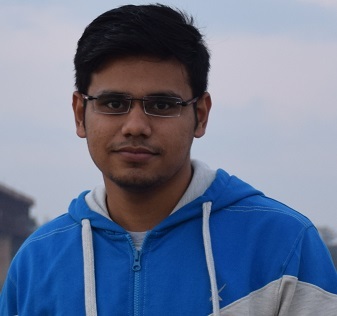 Testimonial: If you are stuck in a CS topic or an algorithm problem, you will probably find a solution on GeeksforGeeks, not only will you find a solution rather you will find an efficient solution which has code in C/C++, Java, and Python. Once we get a solution we are relaxed isn’t? How about writing a solution of a problem faced by you? Such that when others encounter the same problem they can get an instant solution with a clean explanation. GeeksforGeeks provides a platform to share your solution for a problem or approach, while writing I observed that, I use to explore every aspect of a topic such that I can explain it in a simple language. 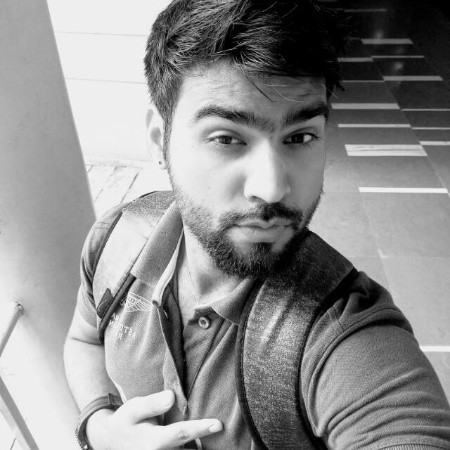 Thank to GeeksforkGeeks for providing me an opportunity to write, if you want to learn and share your knowledge then you are at a right place. Testimonial: After working as a summer intern here, I realized that it is a dream organization not just for the readers and students, but also for the contributors as well. Right from the assistance that one gets here while working, to learning new topics and then writing articles on those topics, it is a highly experience-gaining and knowledge-acquiring process, where you learn and write at each and every step. One thing that I realized during this internship is that it takes a whole lot of efforts to explain something than just knowing it. So, this is one thing where I feel I have made a lot of progress. Overall, it was an excellent journey working as an intern here and will keep contributing in the future as well. Testimonial: GeeksforGeeks is the incredible platform for students to learn, not only students also contributors. 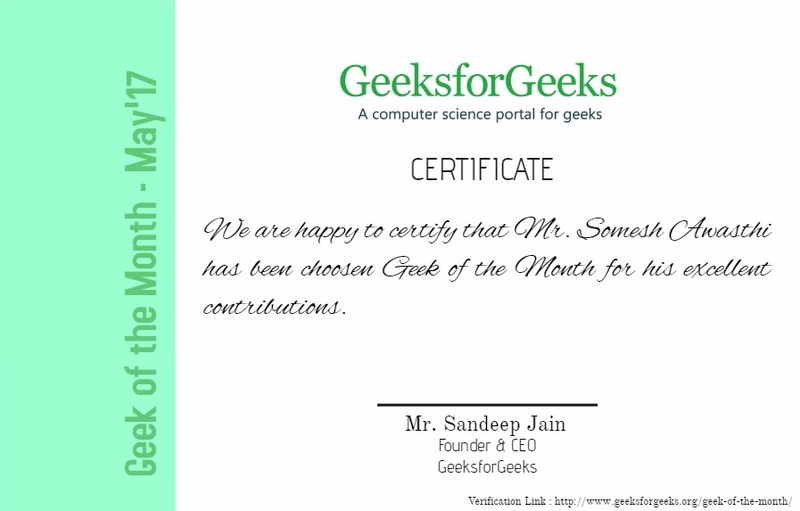 I being the Problem Setter of the GeeksforGeeks is thankful of its entire team for providing me such a opportunity in their platform. While working I learnt many new things and improved a lot in my competitive programming, which is still improving. I suggest every programmer to study algorithms and data structures from GeeksforGeeks. It makes every learner’s concept very clear and makes you learn new things. 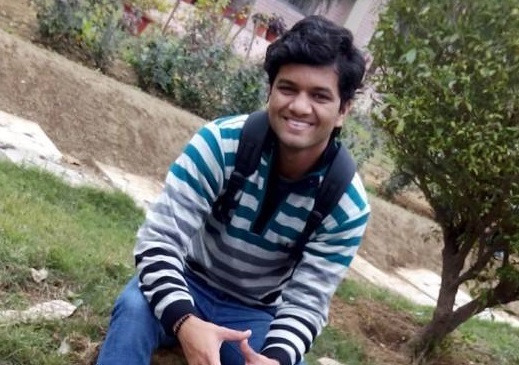 Testimonial: I came to know about GeeksforGeeks when I started facing problems in Algorithms and Data Structures to solve problems solving skill in Competitive programming. GfG helped me enhance my Competetive programming concepts as well as my job preparation doesn’t seem difficult now. The best part about GeeksforGeeks is that we can see different methods to solve the same problem. 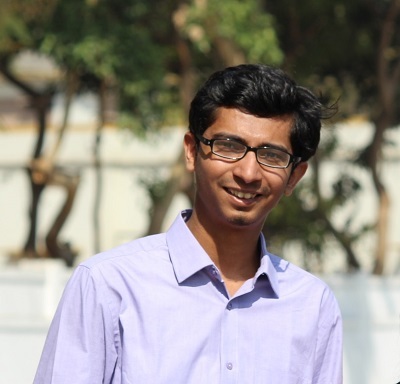 Testimonial : I am a content writer at GeeksforGeeks and my articles are about advanced data structures and algorithms. 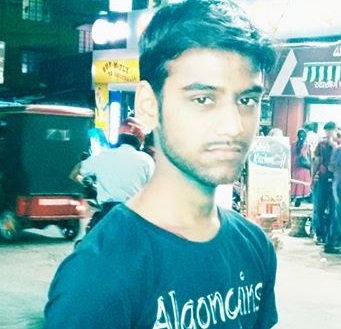 I have written about 12 articles till now and my experience is great. I have learnt a lot while writing editorials. 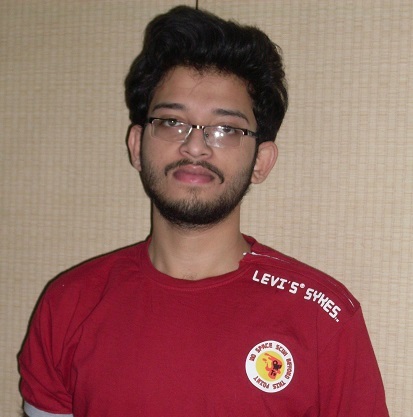 I am a competitive programmer and gained majority of knowledge through GeeksforGeeks. Writing articles helped me lot to improve my competitive performance . I am now able to analyse algorithms more clearly. The best thing that I gained by writing these technical articles is my confidence. Now I feel confident while explaining my logic and algorithm. I am pretty sure that this confidence will surely help me during my interviews as I would be very confident while explaining my logics to the interviewer. I would like to recommend content writing for beginners as it would surely help them in their career. I myself feel as if I have transcended my logical explaining skills and moreover my thinking skills. Testimonial : I being the “Problem Setter and Technical Content Writer” on GFG extend my gratitude to the entire team for the opportunity, I have been provided. While working on such an incredible platform all my mental horizons have been exposed to a level much beyond my expectations. It has given me an exposure to the treasure house of knowledge about Data Structures, Algorithms and many more topics. While going through the incomparable list of articles, I have really developed my mind in a very healthy manner. I had a phobia of Programming when I initially started coding. Then I listen about GFG in my college and as soon as I started going through the site, Programming now seems to be a Cake Walk. The unbeatable and wisely planned Practice Set really do the magic, you develop your ideology and start thinking in a much logical way. Once you have practiced enough on GFG, you not only master the problems but can also solve the problems in a much more optimized manner. Advice to Contribuotrs: I encourage beginners to come forward, gain knowledge through GFG and become a part of it and enrich themselves and others by sharing knowledge. Do refer the priceless and extremely beneficial ballots of articles, programs and Geek Quiz on GFG, that will surely help you in setting the strong base for coding. 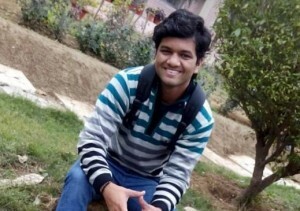 Testimonial: I think GeeksforGeeks is a great platform to learn Computer Science concepts. From beginner to experienced, one can easily find and practice questions according to their level. G4G contains a huge number of technical articles with the proper and clear solution which help many of students to learn new approaches to solving the problem. The best part that I like about G4G is the Interview Corner which help to gain interview experience and student can expect what kind of question can be asked in an interview. As a contributor at G4G, it’s a great experience working with GeeksforGeeks. 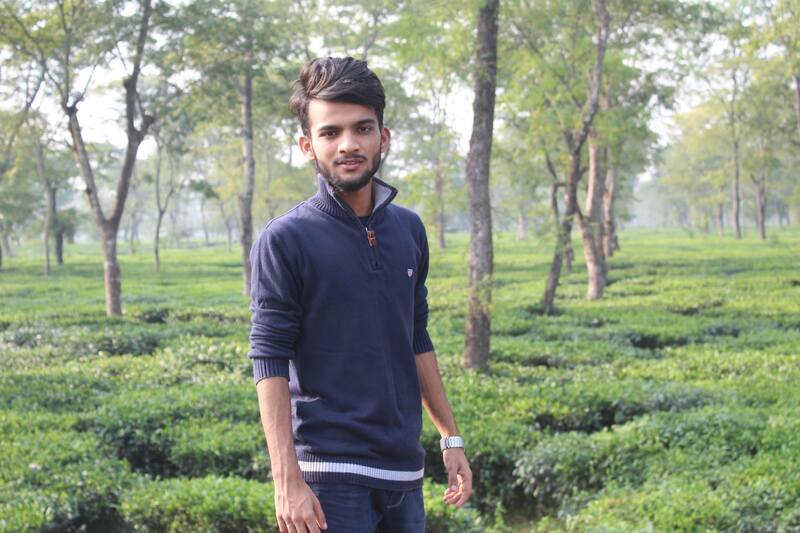 From this experience, I learn not only “how to code” but also “how to write neat and clean code”. Advice to new contributors: According to me, when you are writing an article, just keep in your mind that the reader can be a beginner. So, explain all the possible approaches. And for each approach, try to explain every concept in details. 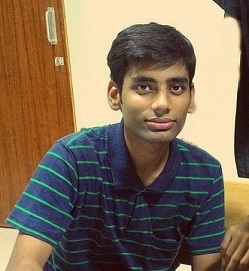 Testimonial: From the time I came to know about GeeksforGeeks, there has been a constant increase in my coding skills. GeeksforGeeks have a collection of articles both for beginner and for experts reviewed by the experts. The best part about GfG is different approaches for the same problem. 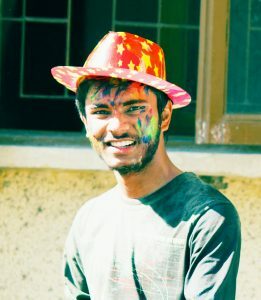 Since every one has unique skills and posses some knowledge, every person must share their knowledge on GfG and help fellow programmers. I’m glad to be a part of GeeksforGeeks. Think of the better approach for every article you read on GfG, there may be a room for improvement. Also try to add the articles on the top of the topics already covered. Testimonial: I got familiar with GeeksforGeeks as soon as I entered college life because of the amazing content it has. 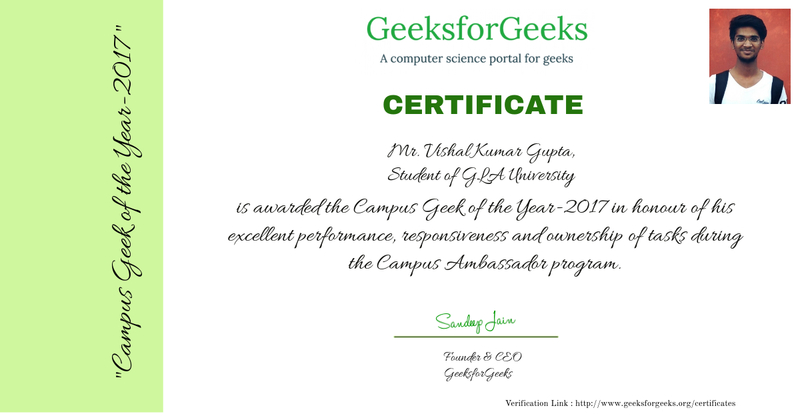 GeeksForGeeks is an amazing platform for Computer Science students. With comprehensive articles available on a range of topics, it serves as the preferred platform for learning any beginner or advanced topics. The exemplar codes provided are well documented and well explained. 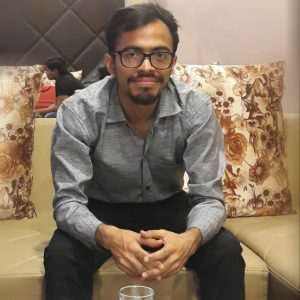 I wrote several articles in Python in past some months and found it as a nice learning curve for myself too as many of my concepts got cleared while preparing those articles. It made me go one step further in understanding how things work! I will like to advice others too to start contributing in any field they are interested! Just make sure that you write your articles with full dedication! Testimonial: GeeksforGeeks provides an incredible platform for learning and sharing code. Diligently structured contents, meticulously designed quizzes and incomparable practice set are few things that have helped GeeksforGeeks to stand out. Its credibility can be appraised by the fact that it’s referred by both geeks and wanna-be geeks. GeeksforGeeks follows a remarkable way of solving problems. It first takes naïve or basic approach to solve the problem and then moves towards more optimized and comprehensive approach. This not only helps one in getting hold of the topic but also demonstrate the power of optimization and I, for one, believes that optimization is the real game here. At last, do refer to GeeksforGeeks as it offers a plethora of codes and articles, which will help you in building a solid coding foundation. Happy coding! 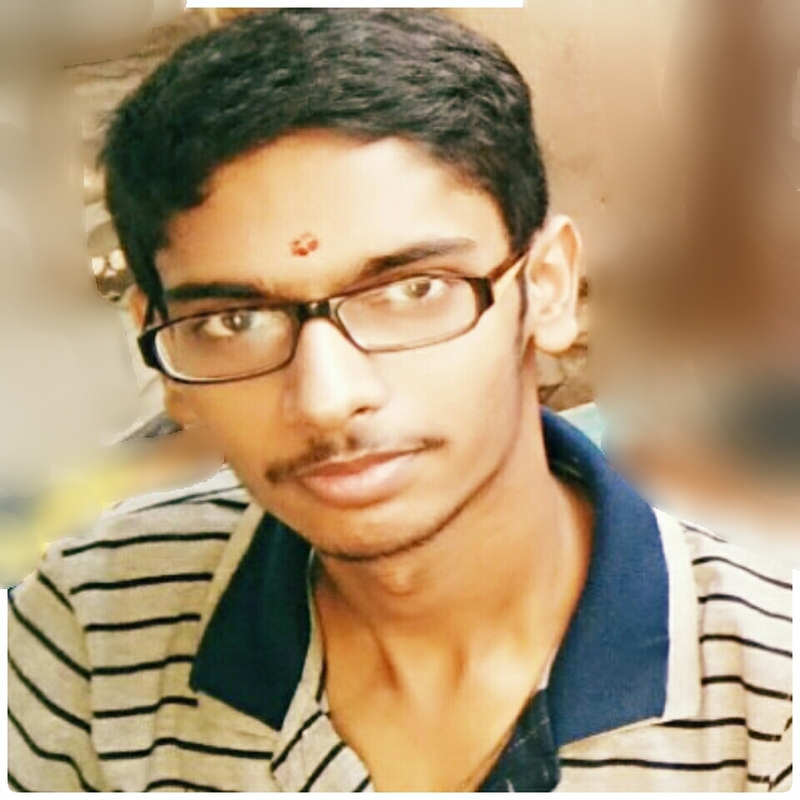 Testimonial for GeeksForGeeks : Since 10 months I was trying to conquer Data Structures and Algorithms which is the most important topic for any CSE or IT student and now because of GeeksforGeeks only I can see improvement in my skills. The articles are well explained and and any beginner can easily grasp the topics. Now also many more things are left for me to explore here such as the MCQs and the interview experiences which i believe will surely help in my future goal. 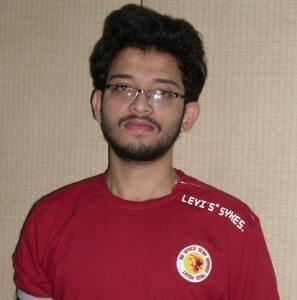 I recommend GeeksforGeeks to each and every programmer whether be a beginner or advanced level. 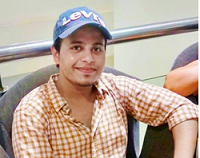 Testimonial for GeeksForGeeks : According to me GeeksforGeeks is a platform for a person from where he/she can start it’s journey very smoothly. To learn things deeply one should start from the zero level , it has to start from the basics and GFG is the best place for those people who actually wants to learn new things , who actually wants to enhance their technical skills and who wants to compete with others in technical aspects. GFG provides all fundamental material of technical subjects using which students can prepare well for their interviews. GFG has also provided online coding platform through which students can solve as many coding problems to make themselves good in coding area and the best thing about GFG is that it has divided the coding problems according to the levels likes school level , basic level , easy level , medium level , hard level which organizes the things together and in a well defined sequence to get started . GFG provides all possible solution starts from Naive approach to best optimized solution for any problem , so people get to know many solutions for a single problem. All the content writers provides well explained articles , in which each line of code and algorithm is clearly explained to the best possible way. The best part about GeeksforGeeks is that it also focuses on other Computer Science fundamentals like OS, DMBS, CN which are also a crucial part of an interview. 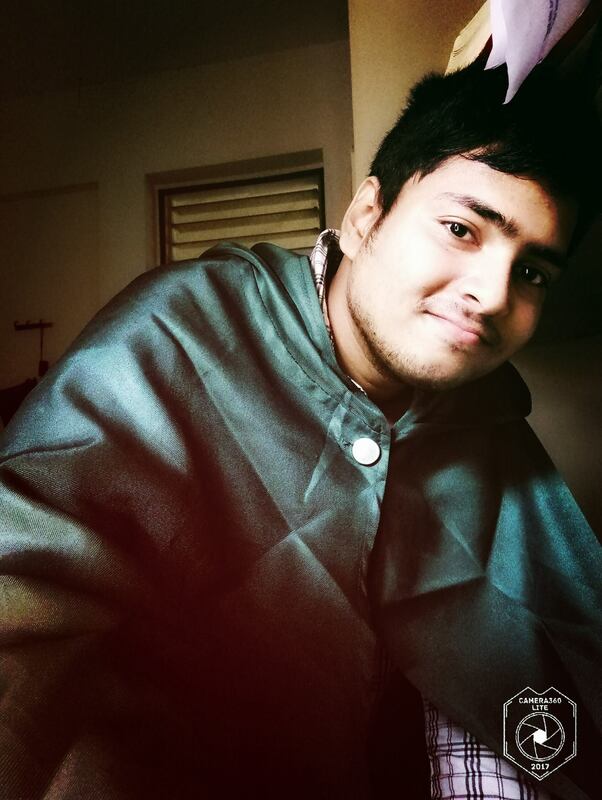 I want to thanks GeeksforGeeks for making such an awesome element for preparation. What I am today is just because of GeeksForGeeks , it gave me everything which i wanted to prepare myself. I got placed in “Opera Solutions” and credit goes to GeeksForGeeks. Advice to Contributors: New contributors should provide fresh content in easy to understand language so that everyone from beginner to expert can understand it easily. They should also give some interesting questions based on the articles so that users can understand the concepts completely. They should write articles according to the beginner’s point of view. 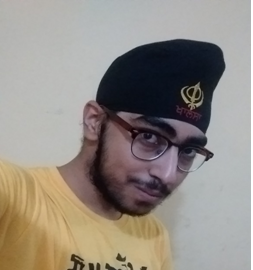 Testimonial for GeeksforGeeks: GeeksforGeeks is by far the best platform I have encountered for learning computer fundamentals. The way GeeksforGeeks provides a solution for a problem by gradually going towards the optimal approach by looking all the other possible solutions is just phenomenal. The best part about GeeksforGeeks is that it also focuses on other Computer Science fundamentals like OS, DMBS, CN which are also a crucial part of an interview. 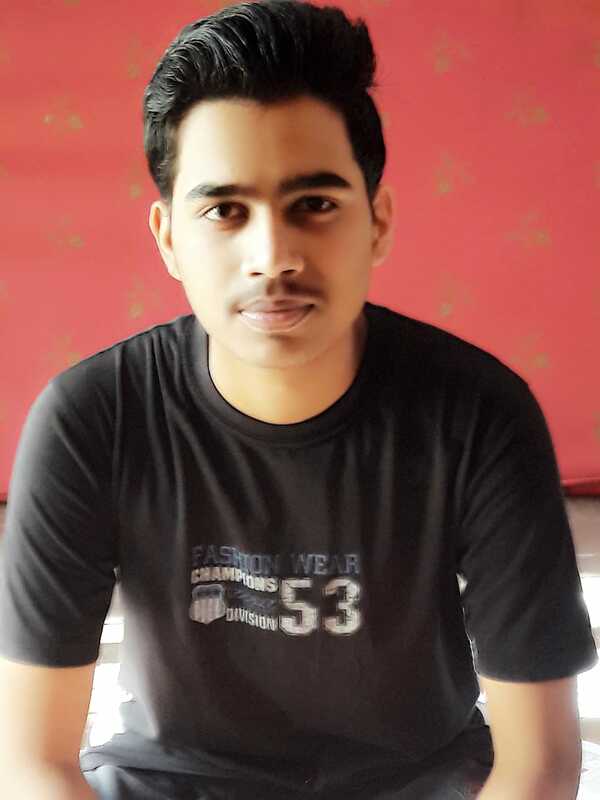 Moreover MCQ’s on Automata Theory and Compiler Design helped me a lot during my college examination. 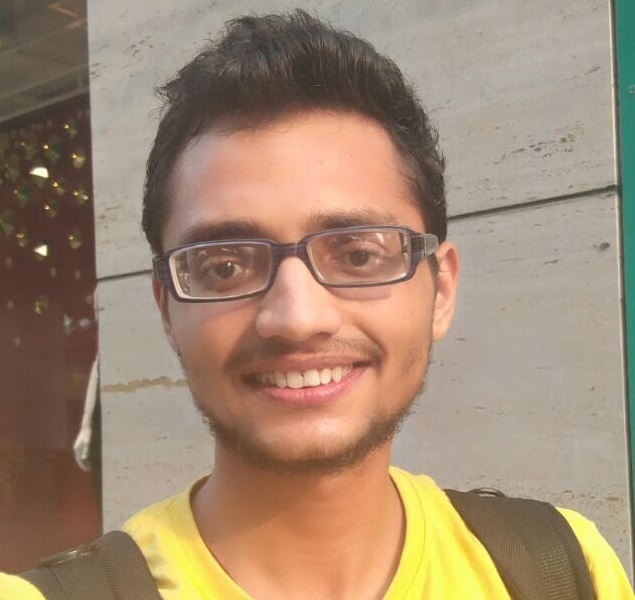 I would strongly recommend one to refer GeeksforGeeks to build their computer fundamentals and also for their interview preparation. Don’t just simply provide the algorithm for the problem, also try to brief the reader how you got to that approach. Writing articles can improve your knowledge to a great extent since you will have to study every small detail regarding your article. Avoid bookish language; try to explain in the simplest way possible. Keep Contributing 🙂 ! 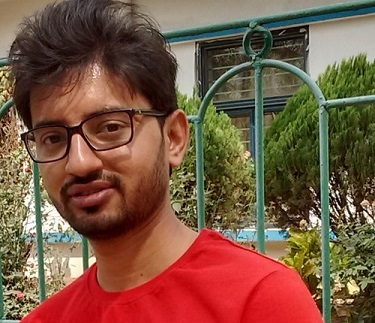 Testimonial for GeeksforGeeks: “GeeksforGeeks” , a popular name in every person’s success story connected to IT industry , has no different story for me. Be it competitive programming, job interviews, various IT entrance exams and even in college or school, G4G stands as a best guide in any domain related to Computer Science for a novice to expert. And this very quality of providing guidance at versatile platforms and at any level of difficulties, be it complex data structures to simple data types, makes it different from other sites. 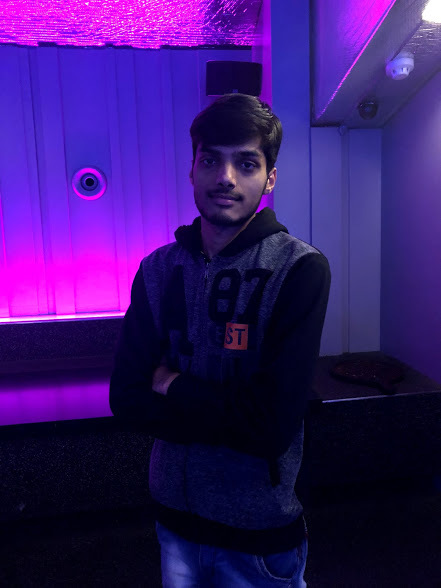 This builds a broad viewership and a connect with all level of people connected with Computer Science in any manner. I again stand thankful to G4G on behalf of everyone benefited from it and encourage it to prosper more in its noble task. Advice for Contributors: Not only as a source of learning, G4G also serves as a platform for sharing the knowledge one exhibits regarding any topic related to computer science from algorithms to facts, from various languages, C++ to java at any difficulty level from a basic to expert. So if you have a topic you think is unique and which can be useful for all people never hesitate to share via the article. Only important thing is to adhere to the G4G rules laid for drafting an article to make it more presentable. All info. can be found on http://www.contribute.geeksforgeeks.org/ . More you share, more you learn. Advice to new contributors: According to me what makes G4G different from all the other websites is their articles. You won’t find even a single website other than G4G that regularly publishes articles. But here you will find articles of all kinds ranging from the most basic ones to some of the most unconventional topics. 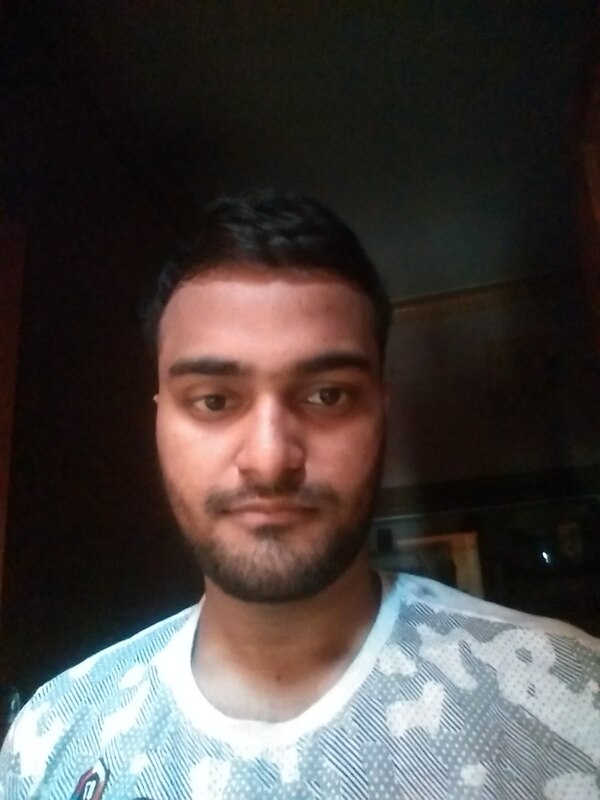 So, I advice others also to contribute and let’s share the knowledge !Testimonial for GeeksforGeeks: If you are related by any means to Computer Science, then you are in a way related to G4G. Whenever you come across any question/ new concept, you search it on the web and the first link you find will be of G4G. G4G is a hit because of its clean and understandable codes (G4G follows a strict list of rules which you can see here- https://www.geeksforgeeks.org/contribute/article-writing-style/). I would thank every single one who has contributed to it and made it a huge success. Testimonial for GeeksforGeeks: I have been using GeeksForGeeks from 2010. 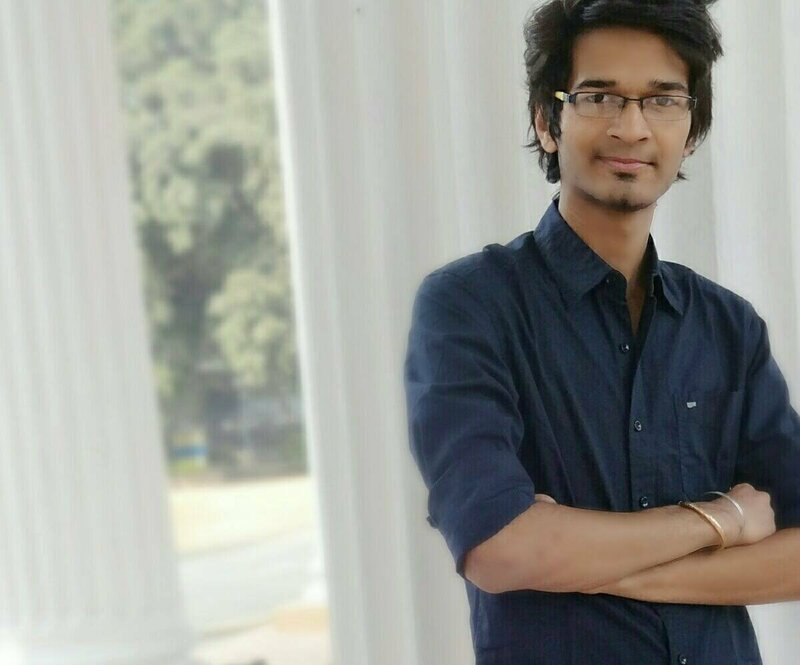 The resources available on Data Structures and Algorithms is undoubtedly exceptional which helped me in college as well as while preparing for interviews before placements. Even after being in IT industry for about 2 years, I regularly enjoy reading interesting articles here. For current students, GeeksforGeeks now has a lot to offer including an outstanding Campus Ambassador Program, Paid Internship Opportunities, Placement Opportunities etc. With the launch of Practice section few months back, GFG officially entered into the domain of competitive programming. I regularly use this section and I found the overall interface including the web IDE to be great and easy to use. Cheers to the team!! Advice for new Contributors: I take GeeksforGeeks as a platform to share knowledge to help fellow geeks. With such huge number of hits on website each day, the content gets great viewership. When you contribute at such a level, you need to ensure high quality. This in turn give you the opportunity to improve your knowledge and also your skills as a content writer. It also gives opportunity to network with fellow contributors and to learn from them as well. Lastly, I would advise you keep making contributions, big or small, as we also have a moral duty to give back to the community which gave us so much. Testimonial: “Wisdom is sharing flowers in our basket and receiving different from others and thereby increasing our worth” and that is what GeeksforGeeks does. 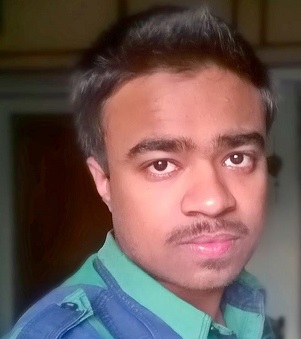 When it comes to placements, there is only one name that comes to my mind – GeeksforGeeks. Every IT graduate depends heavily on GeeksForGeeks while preparing for the technical interviews. 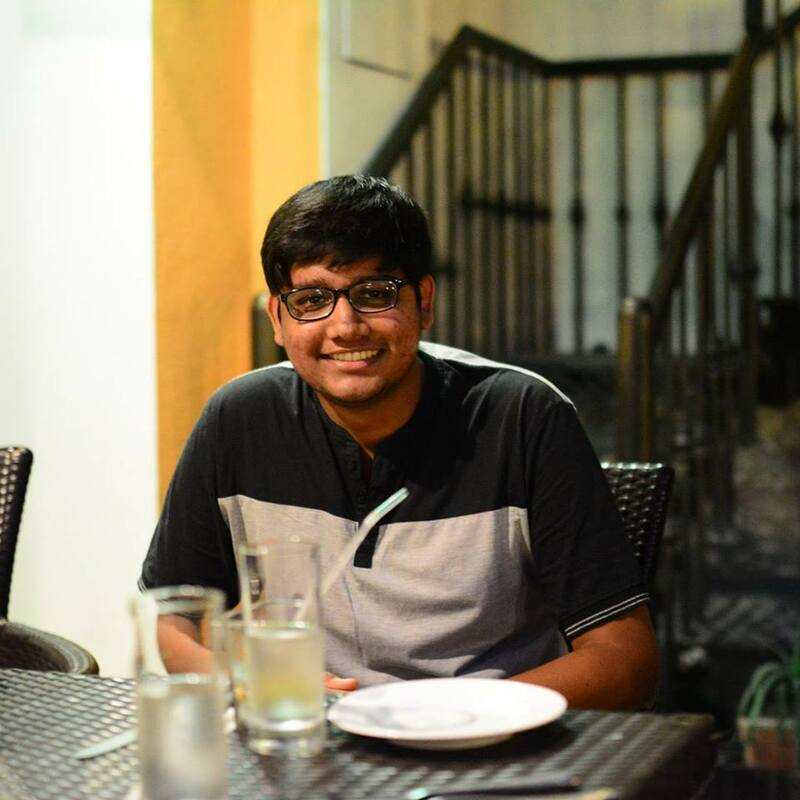 Not just GeeksforGeeks helped me with my interview preparation; it has taught me several best coding practices that have significantly improved my coding style over the years. And the best part is that GeeksforGeeks is expanding. With various new initiatives like Campus Ambassador program, G4G is reaching out to more and more students. It is not just limited to DSA/C/C++/Java articles; it is now becoming one of the best resources for a beginner to get started in world of competitive programming too. We can find huge collection of interview Experiences of top IT companies. One can also find great Stuff for Aptitude based Puzzles and for GATE preparation. Thank you once again GeeksforGeeks for providing the awesome platform for preparation. Advice to new Contributors: GeeksforGeeks provide excellent platform to know other people’s way of thought. So, in the process you learn several ways to solve a problem. During our childhood, learning pace is exponential which tends to decrease with age. GeeksforGeeks helps us brush up ourselves and sharpen our mind and it’s time to give something back to GeeksforGeeks. So keep Contributing and help other geeks!! 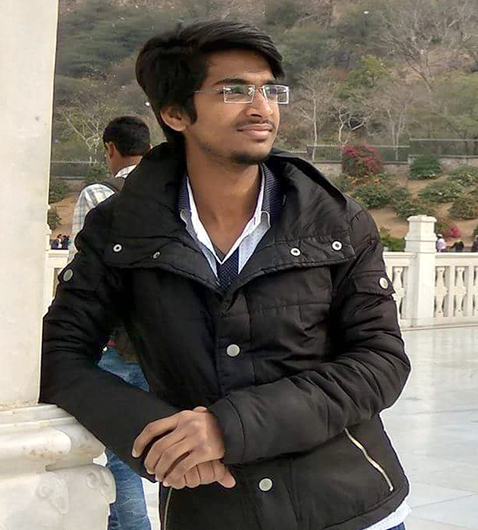 Rahul is our Campus Ambassador for LNMIIT, Jaipur. Testimonial: When it comes to programming, there is no other website which can surpass GeeksforGeeks. Thanks to their talent, GeeksforGeeks has taken off in the search engines like a rocket. In this day and age, it is very difficult to get ahead in the field of Computer Science without the support of gurus like GeeksforGeeks. The collection of articles and questions are superb with excellent explanation and simple solutions. Thank You GeeksforGeeks for providing such a great platform to learn and share knowledge. Advice to Contributors: Knowledge sharing is synergistic. We each enter into a conversation with a little knowledge and each come away with more knowledge. Knowledge sharing is about “working together”, “helping each other” and “collaboration”.Sharing knowledge is not about giving people something, or getting something from them; it is about creating a learning process. Believe in “Learn-Share-Learn” and keep Sharing!! 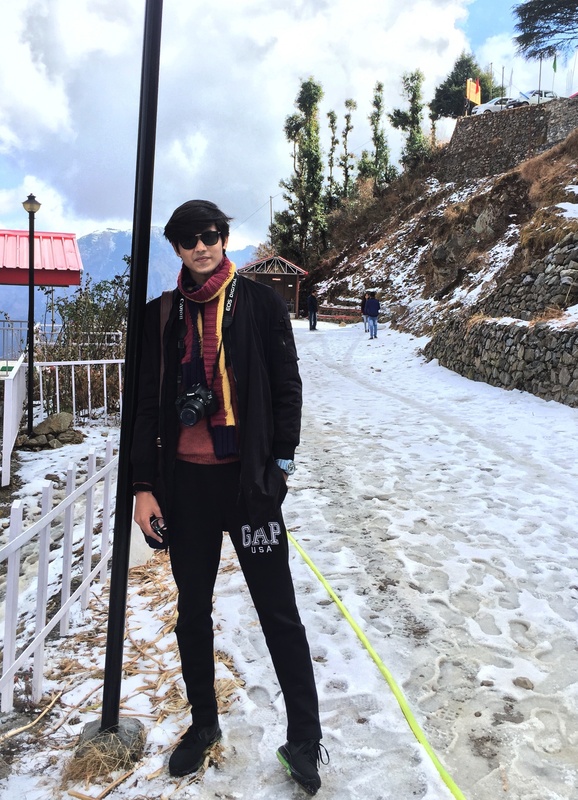 Testimonial : I have been associated with GeeksforGeeks since past 10 months and I’m obsessed with G4G! It’s one of the best sites I’ve ever come across. It is helping people around the globe in achieving their dreams and what else can be better than that ? Its never-ending library has almost all the questions related to programming and a lot of articles are being added daily. Be a novice or a pro, G4G would never cease to amaze you! Need something better? GeeksforGeeks is EXPANDING. 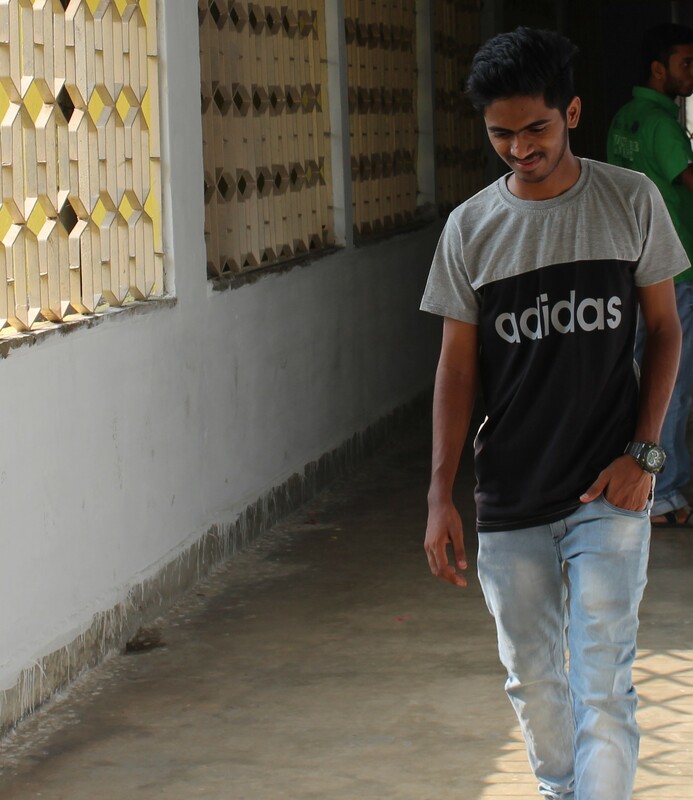 With amazing programs like Campus Ambassador , G4G is reaching out to students in their colleges and spreading knowledge. With the QA Forums, one can ask his/her queries and he’ll be answered. practice.geeksforgeeks.org and GeeksQuiz are again one of the biggest steps taken by them. I wish GeeksforGeeks all the best for the future, which, I know is going to be bright! Advice to Contributors : G4G follows a simple mantra, Learn-Share-Learn. “In teaching others, we teach ourselves” . Contributors work very hard to bring the best out of themselves. My advice to all the contributors out there is to keep working hard and believe in yourselves. Keep the interesting articles simple and easy-to-understand. Make sure that you convey the concepts with help of detailed explanations and more examples. Advice to new Contributors: New contributors should provide fresh content in easy to understand language so that everyone from beginner to expert can understand it easily. They should also give some interesting questions based on the articles so that users can understand the concepts completely. 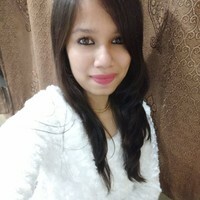 Testimonial: GFG is a best platform for beginner as well as experienced programmers as It has a much larger collection of questions and articles with easy to understand solutions and It also has very active discussion forum which attaches you to a very large coding community and helps you a lot. Testimonial: GeeksForGeeks is one of the best sites I have seen. Working on an initiative to help programmers out there in such selfless manner is worth applauding. Also, It has provided platforms to many potential coders to contribute their ideas. The variety of posts ( Question specific, Q&A, Project Ideas, Quiz etc ) has enhanced its reach ability across all domains. It was GfG only which motivated me to make my first extension (GeeksQuiz). Not only for B.Tech, but M.Tech and especially for job-seekers, the site is of much help. Advice to new Contributors: GeeksforGeeks has always maintained a standard of questions and is all due to collective efforts and contribution of every contributor. Believe in quality than quantity. So keep posting interesting & useful articles, your experiences and help others!! Testimonial: I was already familiar and quite good with competitive programming but the questions asked in interviews and those in competitive programming challenges are not completely similar. 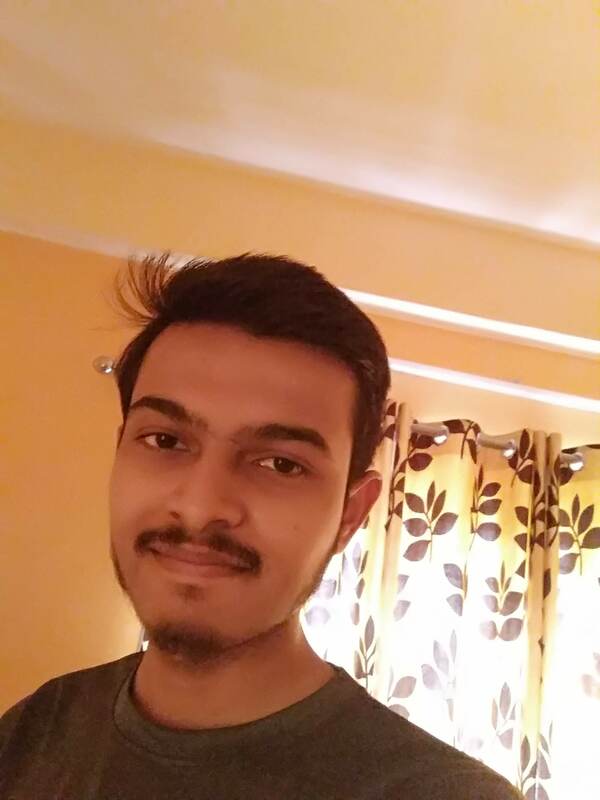 GeeksforGeeks provided me the perfect environment to practice a variety of algorithms and very standard interview questions, that were both challenging and interesting. 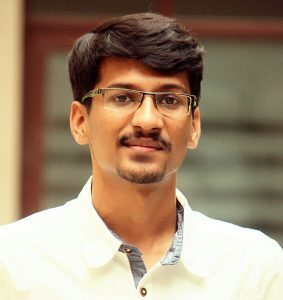 When you sit for an interview, apart from programming, majority of questions are asked on C/C++/Java/OS/Networking/OOPS and several other topics.G4G has a large number of useful articles on these topics all setup in a well-structured manner that helped me to get my skills from novice to an advanced level. Overall, G4G helped preparing me and many of pals in cracking the written as well as face-to-face technical interviews and landing at very good companies. I thank and appreciate the team to provide such an awesome platform to sharpen my skills and enhance my knowledge. I would recommend this site to everyone who is planning to go for technical interviews. A word of advice to my fellow mates – being consistent is very important and try implementing your own code before jumping to solutions (just reading the solutions and jumping on to next questions is not enough).